…if I hadn’t already lost too much! Mindless dogma rules in the world of weight loss, specifically fat loss. The following drivel is an example from the blog article titled Guaranteed Fat Loss Workouts. The Battle of the Bulge is created by a sedentary lifestyle and eating foods high in calories and beverages. It takes months or years to accumulate, and unless you opt for liposuction or another invasive type of surgery, the only way to undo the weight is diet modification and exercise. Fortunately, there is some guaranteed fat loss workouts, even the best hope to use food as May on the road to a body slimmer, trimmer and more fit. Follow that link above for the rest of the story. Meanwhile, unless you know exactly what the scientific research literature says on this topic, you may not see the obvious holes even in the introductory paragraph above. First off, a sedentary lifestyle does not cause weight gain. Secondly, eating foods high in calories does not cause weight gain. This is the kind of sloppy thinking and dogma-parroting that divert important attention from finding the real causes of weight gain and obesity. No matter what exercises are advocated in this article, I guarantee you that fat loss will be hard to accomplish by using them. Just a little rant here. What I will guarantee is that nothing I say on this blog is unsupported by good scientific research. 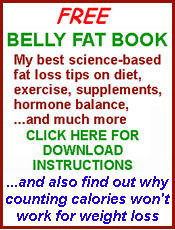 That is the whole point of BellyFatScience.com.